Going to top of the Burj Khalifa in Dubai – 124 floors – was one of the highpoints of my life, literally. And when someone builds a bigger structure I will go as far up that as I'm allowed. But I've only ever been on two roller-coaster rides in my life: I was terrified of the almost vertical drop on my first, and heavily self-medicated when I did the other. So it's not height as such which worries me, it's falling from a great one and feeling I have no control over it. But when the instructor asked the question, I stayed silent. After all, this was a quad bike ride across sand and I could control my speed to some extent. If much of Australia's suburban Central Coast – the region north of Sydney – looks like endless Orewa, then the dunes near Port Stephens owned by the indigenous Worimi people are like endless Hokianga. 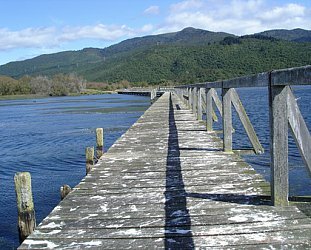 Here above a massive sweep of beach are acres of bleached white dunes – peppered with middens – which are advancing inland at the rate of five metres every year. It's the highest and largest moving coastal sand mass in the Southern Hemisphere, so if you live locally you don't have to worry about going to see them, because they're on their way to you. 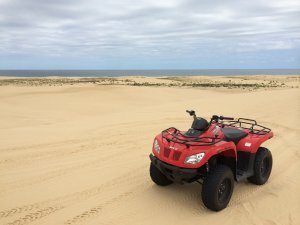 This huge protected area of rolling and sometimes precipitous dunes on the Tomaree Peninsula about halfway between Newcastle and picturesque Port Stephens (two hours from Sydney), is where hundreds come to enjoy blasting around the dunes on guided tours, or in my case, to face an unspoken fear. Still, if eight-year olds can do it . 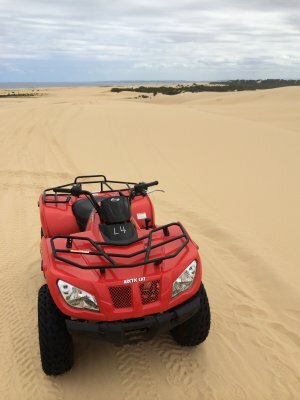 . .
SandDune Adventures – a company owned by the Worimi who are astute, business-minded and respectful of the land – also offer Hummer tours from the nearby Murrook Aboriginal Cultural Centre and sand board trips. 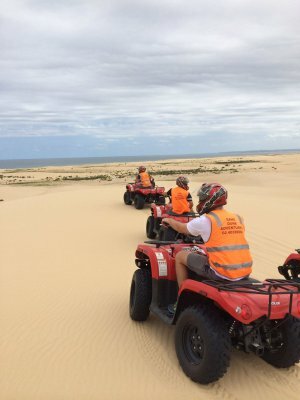 But an hour around the dunes on a quad bike is a self-drive thrill. 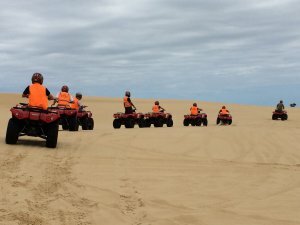 You learn quickly that following the tracks of the guide is a smart move – one of our gung-ho guys chose not to and got stuck in deceptively soft sand – and I'm always respectful of superior knowledge. However when we got to the top of our first steep descent – I'd guess a 45 degree slope – and he said, “Just give it a bit of accelerator” my response, not verbalised, was “You've gotta be joking, pal”. You soon learn though that the accelerator is more your friend than the brake: It gets you out of tight corners and soft sand, and a bit of speed on the way down will prevent you from flipping - which you could do if applying the brake. So “a bit of accelerator” it was and . . .
By the second descent – maybe 50 degrees – I couldn't wait and gunned it, and now there was no stopping me. For the next hour – where a brooding sky of low grey clouds hung over the dunes and we could see the blue of the ocean – our small party rode in a beetle-like queue, a high-speed motorised caravan, I the Lawrence of Tomaree taking up the tail end. Later in the afternoon I spoke with John, a young Worimi guy who admitted he'd drifted a bit after finishing school, drank too much for a while, but now had settled down with a job at SandDune Adventures and was learning more about his people's history. Given the mob's proximity to the ocean it was no surprise to find they were experts at fishing – the tribal totem is a dolphin – and that there are fresh water rivers running beneath the sand on the beachfront below the towering dunes, less than a half a metre below the surface. Of course, you have to be Worimi to know where they are. He asked me if I'd enjoyed blatting around the dunes and I laughed loudly. That said, I'm still not going to go near a roller-coaster. 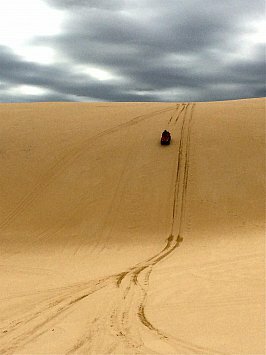 But accelerating down a sand dune at 50km/h is a wind-blown thrill. Now I'm thinking . . . hang-gliding?